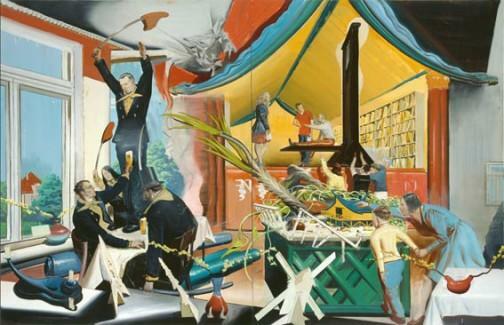 If I could be someone other than me, I’d be artist Neo Rauch. Rauch was born in 1960 in the former East Germany. His large canvas paintings (see a collection at the David Zwirner gallery website) are vibrant and peculiar, a sort of pop Surrealism. If he were a writer, he might be Milan Kundera meets Gabriel Garcia Marquez meets Aldous Huxley. Seeing Rauch’s work makes me realize why it is I have always loved Surrealism. Back when I was a student at the university taking art classes outside my degree program, our drawing teacher told us to do a pencil drawing in the style of a favorite artist. I picked Rene Magritte. One of my drawings was of an abandoned house with wood plank floors and holes in the walls. 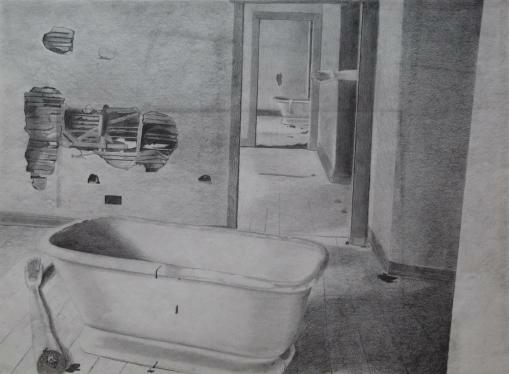 A bathtub sat in the room closest to the viewer, and next to the tub a severed arm. The arm repeated in each of the next two rooms as you moved back through the house. Another drawing was men’s dress shoes floating past a cinder block window. 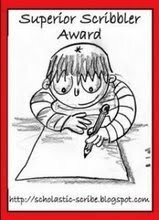 There are many reasons, too many to talk about in this post, why I didn’t pursue fine arts. I didn’t pick up my pens and pencils and paints again until only recently, and I’m still working on believing in myself as an artist. I’m not sure I’d know what to do with a large blank canvas. So, instead, I lust after artists. I covet their works and their lives. I make a game of it. When I see a brilliant artist (I do the same thing with brilliant writers), I say “I want to be him.” And since I can’t really be him, I then walk down the ladder of my own version of Maslov’s heirarchy of needs: I paint like him. I’m married to him. I had his exact childhood experiences (except in the case of Rauch, whose parents died in a train wreck when he was an infant). Finally, I land on a plausible fantasy: I own a piece of his art. I fill in the details of how I could have come to own such a painting. I came across him many years ago when I went back to Spain; he was unknown and I bought his painting for almost nothing. Except, of course, I didn’t. I don’t own a Rauch, and I can’t afford him now. The best I can hope for is to find a reason to be in New York before his exhibit at the Met ends October 14 (to learn more about that exhibit, read this article in the June 4, 2007 issue of The New Yorker). And if I can’t do that, all I ask is that one of you who does make it to New York go there and see the exhibit and then tell me that Rauch is as great as I think he is and that my fantasy life is worth the trouble.